A note to Jones County, Mississippi, descendants: In this post, Ed Payne shares documents featuring numerous ancestors by name that you may never have seen! My thanks to Ed for once again publishing his careful research on Renegade South. A few weeks ago I made one of my frequent visits to the William Winter Library at the Mississippi Department of Archives and History. My task was to search out a state Confederate pension file. I located the microfilm roll and was happy to find it relatively free of scratches. So I printed the image (which typically under-exposes the top and bottom of the image) in order to scan it to my computer as a jpeg file. While attempting to produce a half-way decent reproduction, a staffer came by and mentioned that these records were now available on the FamilySearch website. Curious, I returned to my office and tracked down the file. I was amazed to find the same image in pristine condition and downloadable as a jpeg file. Indeed, the image was so sharp I could see the embossed notary public seal. I decided to take a closer look at the Mississippi-related records that have been added to the FamilySearch site. FamilySearch is a free repository of genealogy-oriented materials hosted by the Church of Jesus Christ of the Latter Day Saints (LDS). LDS teams have microfilmed a wide assortment of state and county records over the last half century. Like many genealogists, I initially made use of FamilySearch because it was free. But after I began researching in state archives and subscribing to services such as Ancestry and Fold3, my use of FamilySearch fell by the wayside—until the helpful tip prompted me to re-evaluate what the site has to offer. The answer is that FamilySearch provides access to some very valuable source documents for those interested in the Civil War and its impact on the Mississippi Piney Woods region. To view these records, go to the FamilySearch home page (https://www.familysearch.org). Scroll down to the bottom half of the page to reveal the ‘Browse by Location’ selector and click on ‘United States.’ When the next page appears, select ‘Mississippi’ from the list of states. The Mississippi records are organized into 10 groups, of which three pertain only to Tippah County. Other than marriage records, which have been transcribed into a database, and a caveat concerning Civil War service records discussed below, all other materials are images of original documents. In the remainder of this article I will offer an overview of the records found in the six statewide image collections, and specifically those pertaining to Jones County. Of these, I found the Jones County records in the ‘1863-1868’ subgroup the most interesting. They are actually a portion of a statewide survey undertaken in early 1864. The purpose was to ascertain the names of all men who had enlisted in CSA units, as well as tallying the women and children deemed indigent as a result of the war. The list of 477 soldiers is probably the most comprehensive enumeration of Jones County men who joined, however willingly or grudgingly, Confederate units. Even though the Knight Band had formed the previous October, and many of its members were known to the county supervisors conducting the survey, their inclusion on the lists indicates the supervisors’ diligent effort to record all Confederate enlistees—regardless of their subsequent actions against the Confederacy. For example, among the names recorded within Beat 2 West of the Tallahoma were those of Knight Band members Terrell (‘Tirrel’) Welborn , Timothy Welch , Lazarus Mathews (‘Mathis’) , Patrick Valentine , and Jasper (‘J.J.’) Collins . Also listed was William Mauldin , who would enlist in the Union 1st New Orleans within three months. A closer examination of the documents suggests the determination of which women and children were considered destitute may have been subjective. In Beat 1, 31 women were tallied as destitute out of 85 soldiers listed (the subtotals on the documents contain addition errors). In Beat 2 East of the Tallahoma, however, every wife and child of the 34 soldiers was classified in that condition. In 1888, the Mississippi legislature authorized the first annual pensions for CSA veterans who had lost a limb or been otherwise incapacitated during the Civil War. Two years later the new state constitution included destitute widows under its provisions. The 117,637 pension application documents in this group are subdivided by surname (e.g., ‘Aaron-Aikins’), with each containing anywhere from 475 to 775 documents. These applications date from 1900 onward; pension rolls covering the period 1889-1900 are found in the ‘Mississippi Confederate records, 1882-1949’ group. Pension applications provide information on the residence of the applicant, the name of the soldier / veteran (if filed by his widow), date and place of marriage, date and place of soldier’s enlistment, and the unit in which he served. On the reverse, the information was attested to by one or more witnesses and authorized by the county’s Chancery Clerk and members of the Board of Supervisors. It is possible to find multiple records for a single veteran in the files. Periodic revisions in the pension law required submission of new applications. Also, when veterans died their widows had to file under their own name. Locating records for a specific individual can be tedious, since a process of elimination is required to bracket the page range within which the application sought should be located. If the application was filed by the widow of a soldier, it will be arranged according to her given name. The size of each image file (nearly two megabytes) makes for slow loading. Therefore, one’s best bet is to check on local availability of Mississippi Confederate Pension Applications by Betty C. Wiltshire (Carrolton, MS: Pioneer Press, 1994). This three volume index includes the name of the applicant, name of the veteran, unit in which the veteran served, application year, and county of residence. The index can verify if pension files exist and under what name(s). State pension officials depended on the county supervisors to exercise vigilance in rejecting ineligible veterans and widows. County officials, on the other hand, were inclined to approve applications where circumstances warranted and generally applied pragmatic standards as to what constituted ‘honorable service’ to the Confederacy. For example, Merida (aka Merady, Marada) M. Coats enlisted in Company F of the 7th Battalion, Mississippi Infantry on 13 May 1862. Subsequent muster rolls show him AWOL from July 1863 through February 1864. As previously noted, the Knight Band organized in October of 1863 and his name appears on the rosters. But when Confederate Colonel Robert Lowry led his forces into the Piney Woods in April of 1864, Merida was among the renegades who fell into his dragnet. Sent back to his unit, he became a captive of Union forces at Kennesaw Mountain, Georgia on 3 July 1864. He was imprisoned at Camp Morton, Indiana for the remainder of the war and finally released on 20 May 1865. Merida Coats apparently never applied for a Mississippi Confederate pension, but seven years after his death in January of 1917 his widow Sarah did. Jones County supervisors approved her application and the signature of U.S. (Ulysses Sherman) Collins, the son of Newt Knight lieutenant Jasper Collins, was affixed in his capacity as Jones County Chancery Clerk. The records of Educable Children for Jones County available on FamilySearch are currently limited to 1920 and bi-annual listings from 1927 through 1949. Still, they can be used as a supplement to census data. The enumerations are generally organized by incorporated areas (subdivided by Wards) and elsewhere by Township / Range. Listings are further broken down by race. Since the lists are lengthy (303 pages for 1920; 499 pages for 1949), finding a family can be difficult without knowledge of their location during the time period. This group is subdivided by county. The Jones County records include tax rolls for the years 1827-1837 and Civil War records compiled by the Works Progress Administration (WPA) circa 1936-1939. The late Jean Strickland transcribed nineteenth century tax records for many Piney Woods counties, but FamilySearch provides the opportunity to see the document images. For example, the 1827 tax rolls were compiled the year Jones County was established and listed the early settlers on 25 pages. The tax records consisted of two sections: 1) an audit of personal property owned, including both slaves and livestock, and 2) an audit of real estate ownership. The county’s first tax assessor was Stacy Collins, who would have several sons and nephews join the Knight Band 36 years later. The Civil War records subgroup consists of 43 images of a folder and its contents. Of these 31 are rough notes, while six comprise a typescript of Confederate veterans and widows enumerated in 1907, and five are typescripts of the muster rolls for the 7th Battalion MS Infantry, Companies B, C, and F; 8th MS Infantry, Company K; and 27th MS Infantry, Company B. 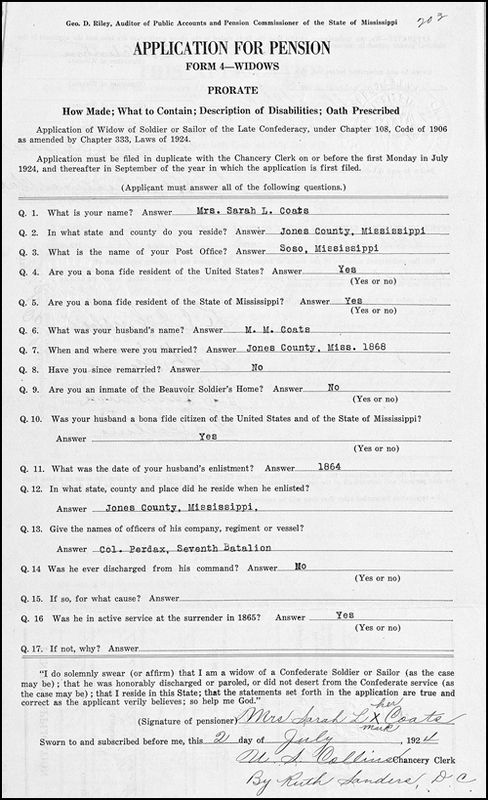 The typescript of the 1907 enumeration lists 166 persons who resided in Jones County at that time and were receiving Mississippi Confederate pensions. The information was transcribed from notebooks provided to the surveyors. (Images of the actual notebooks are found in the ‘Mississippi Confederate records, 1882-1949’ group.) It should be pointed that Mississippi, like most other Southern states, authorized pensions for those who joined Confederate units formed in other states. Thus out-of-state Confederate veterans who relocated to the Piney Woods when the timber boom began in the 1880s could later apply for a Mississippi pension. The transcript includes the state of enlistment. 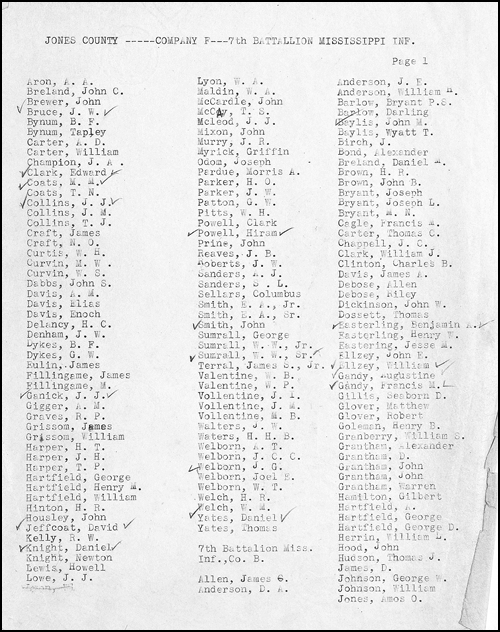 The typescript of enlistees by regiment and company represents efforts by WPA researchers to compile comprehensive muster rolls. In doing so, the muster rolls included not only those residing in Jones County, but enlistees from surrounding counties as well. Thus, although Newt Knight lived in bordering Jasper County, the typescript includes his enrollment in Company F of the 7th Battalion (‘Knight, Newton’ third from bottom of first column). This explains why the list totals 615 names—more men than were of military age in Jones County alone. 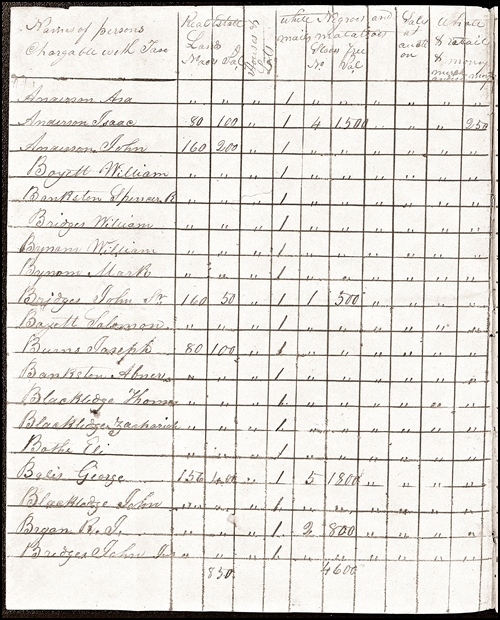 The WPA muster roll typescripts, combined with the 1864 enumeration, provide a means to identify the men from Jones County who served in the Confederacy. From this we may be able to better assess the proportion of men who joined the Knight Band and/or enlisted in the Union 1st New Orleans Infantry. Despite the promising introductory text, FamilySearch does not provide access to muster roll records. Instead, these groups merely allow one to conduct a search of the FamilySearch database by entering a first and last name. 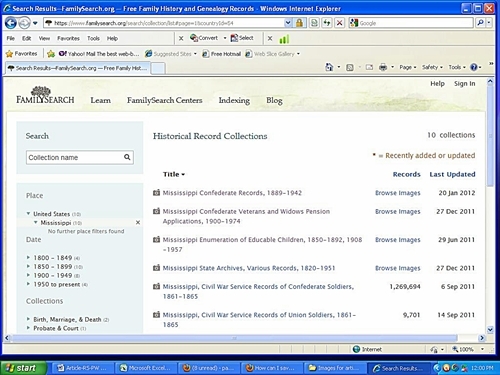 If the search is successful, FamilySearch provides a link to the records on Fold3—but a subscription is required for full access. All-in-all, the array of original document images added to FamilySearch is intriguing. Those who research the history and genealogy of the nineteenth century Piney Woods of Mississippi—or those whose quest is further afield—owe it to themselves to visit FamilySearch and familiarize themselves with the materials now available. Note: The images downloaded from FamilySearch and reproduced for this post were modified using PhotoScape software. The modifications were done to increase legibility and compensate for the considerable reduction in detail necessitated by WordPress requirements (illustrations limited to a maximum horizontal resolution of 500 pixels). Ed, this is quite a find for me. I continue to search for information about Jacob Sumrall’s parents, and now I see that Nancy Sumrall is listed on page 15 (the last page) of the indigent ande disabled conferederate soldiers and dependents list, fourth from the last (the last is Gatsy Collins). I can’t tell if the total is number of children or number in family, and of course am not sure if this is “my” Nancy that later married Moses Holifield, but it seems it could be. I note several Sumrall men listed in those pages, but no Elijah! Guess I’ll just have to keep searching. By the way, if you haven’t had time to search all these documents, I also found Samantha Rushing in the 1853 Mississippi Census with 1 male and 5 females in the family. Good to hear from you and glad you find the FamilySearch records as interesting as I do. As you probably observed, the six men who enumerated the five county Beats each did so in their own way–as one might expect for Jones County. The tally on image 15 (Beat 2W, pg 2) should be the number in the family. However, I suspect that by that point in the war women had good reason to hide the identity any sons in their teens. After all, who knew how long the war might last and if the Confederacy might drop the conscription age to 15? So Nancy Sumrall may have sent her sons to the woods and reported only herself and Jefferson, age 3. I believe the reason Elisha is missing is due to his pre-war residence and enlistment in Alabama. As I noted, the enumerators seem to have only listed men who resided in Jones County when they enlisted. If I have the correct Elisha Sumrall (there were several), he joined Company I of the 36th AL Infantry–only to die of disease within a few months on 4 Jun 1862. Documents on Fold3 show his wife Nancy petitioned the court in Wayne County for his back pay. By the time she received it (2 years after his death), inflation had made the $50.66 essentially worthless. If you don’t have access to Fold3, let me know and I’ll email you copies of the papers. The fact that Nancy filed her petition in the Wayne County court and listed her mailing address as Buckatunna suggests to me that the family resided there in 1860. But they seem to have been missed by the 1860 census–which most likely could have resolved the questions surrounding Jacob Sumrall’s parentage. Ed, I don’t have access to Fold3, and would greatly appreciate it if you would send me copies of those Nancy Sumrall papers. I think you are right about teenage children being sent out of the home. Also, since I don’t think the Sumrall family were of much means, it wouldn’t be unreasonable for a boy 10 or 11 years old to be working for someone else if that would bring in some income. There could be many reasons why any child over 10 or 11 would not be living at home during such troubled times. If you don’t still have my email address let me know and I’ll get it to you. By the way, I haven’t had time to really go into all those documents – did you find anything for our common grandmother Martha Rushing Walters in the documents? I have emailed the Nancy Sumrall documents to you. 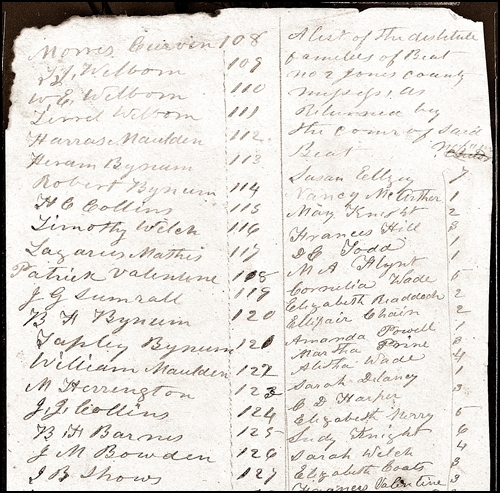 Martha’s husband is found on the list for Beat 1 (FamilySearch image 3, no 50) as ‘Walters, G.W.’ Martha and her children were not tallies–I assume because of the supervisor not considering her among the destitute wives, widows, and mothers. Ed, two names in the Jones County “1863-1868” subgroup are reassuring, but puzzling. The names “Martin Parker” and “Marion Parker” (Beat 1 enumeration) further convince me that the Littleberry Parker family left Washington County, AL soon after 1860 and returned to the Ellisville vicinity, before many moved on to New Orleans. But why are brothers Martin and Marion on a Jones County list dated 1864? They were soldiers in the NO Infantry by the end of 1863, were they not? Was Beat 1 really canvased in early 1864? What circumstances cause a name to appear on the list? Does it include names of men due for conscription, but who have actually flown the coop? Robert: Sorry for the delay in responding but I have been on vacation and off the grid. Based on what I have been able to ascertain, in early 1864 the State of Mississippi requested each county to compile a list of all men who had served in the Confederacy. This occurred around the same time that the Confederate Congress passed an act to facilitate such a census of soldiers. As can be seen from the listings, counties and even beats within counties used different formats. But they generally listed all local men who had volunteered (prior to the Conscription Act of 1862), enlisted, or been conscripted. The census also included men who belonged to local militia units. As I noted in the article, names found on the lists indicate that Jones County officials sought to include ALL county residents who had served in the Confederacy – regardless of their subsequent actions. The Newt Knight band formed in October of 1863. And it seems very likely the county supervisors conducting the survey in February 1864 knew who sided with the renegades. Nevertheless, many men whose names appear on the Knight Band rosters are also listed on the census due to their earlier Confederate service. This makes the census all the more valuable. As you noted, the inclusion of Marion and Martin Parker on the census of soldiers suggests they had returned to Jones County by 1862-3. It is possible they did so due to the area’s reputation as a haven for anti-secessionists and disgruntled ex-Confederates. 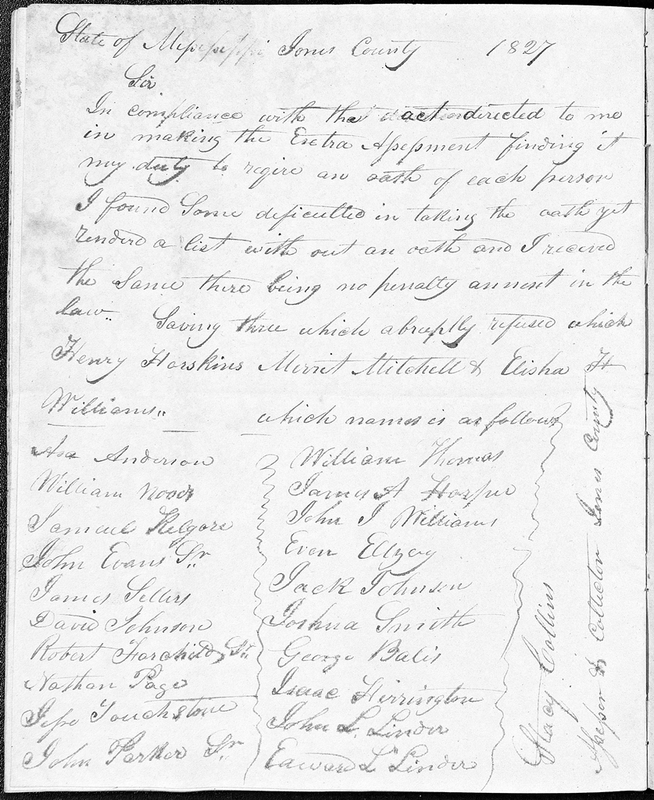 The records of the 1st New Orleans Union Regiment show the Parkers were among the earliest enlistees, signing up on 20 December 1863 along with Obediah Parker. Most Piney Woods men did not join the 1st New Orleans until the following Spring, after the Confederate campaigns in the area led by Col. Henry Maury and Col. Robert Lowry. My guess is that the spouses of Marion and Martin were residing in Jones County in February 1864 and they reported the prior Confederate service (possibly in Alabama) of their spouses. MY AUNT KATE FOREST LORD WAS A GREAT GRAND DAUGHTER OF JAOCB THOMPSON. BEFORE HE PASSED ON HE SAID THOMPSON WAS CONNECTED TO JOHN WILKS BOOTH. CAN ANYONE ENLIGHTEN ME ON THOMPSON? I cannot find Confederate service records matching Marion and Marin at Fold3. On the other hand, the AL 36th Infantry Regiment (Company I) may be a possibility. A roster dated May 13, 1862 includes the names “Marion Parker”, “M. M. Parker”, and “ J E Inman”. Admittedly, Martin’s initials are “M V B” and Marion’s brother-in-law is Alexander Inman. Still, Company I was recruited in Wayne County and vicinity. The ages are consistent. And, in a later roster (January 2004) the three names are missing. As you know, Martin, Marion, and Alexander wind up in the New Orleans Infantry. Did they enlist in the AL 36th first and serve a few months, or are the three names just a coincidence? Ed Payne is a careful researcher and I thought his tips may be useful to your own research into your Civil War ancestors.